Iraqi civilians are said to be enduring dire conditions after fleeing the Mosul area as the army attempts to retake the city from so-called Islamic State (IS). Some 5,000 people have crossed the border into Syria in the last 10 days, the aid agency Save the Children says. They have arrived at the al-Hol refugee camp where conditions are already reported to be filthy and overcrowded. Up to 1.5 million civilians are thought to still be in Mosul, and up to 5,000 IS fighters. 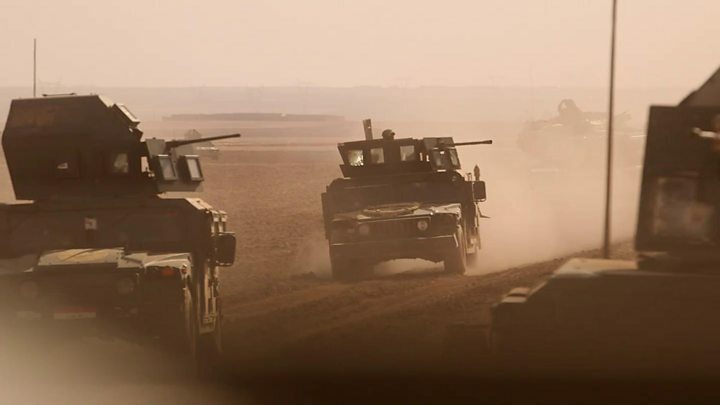 The commander of the US-led coalition against IS, Gary Volesky, said the militant group's leaders were fleeing the city, but did not say who was leaving, or where they were heading. The whereabouts of IS leader Abu Bakr al-Baghdadi are unknown. Some reports say he is in Mosul; others say he has fled. The UN is preparing for what it fears could be the biggest man-made humanitarian crisis in recent times. Refugee camps are being built in the south, east and north of Mosul in preparation for a flood of people fleeing the city. The UN says it expects at least 200,000 in the coming days and weeks. Mosul residents had been told by the Iraqi government that it might be safer to stay in the city while the operation is under way - with fears IS fighters have booby-trapped roads and placed snipers on routes in and out. But there are also fears that IS militants could use residents as human shields by moving into their neighbourhoods, and concern that the group may even use chemical weapons. Residents, reached by telephone by Reuters news agency, confirmed that IS was trying to prevent people from fleeing the city and had directed some of them towards buildings likely to be targeted by air strikes. Many of those in and around Mosul who have already escaped have headed west to camps across the border in Syria, including al-Hol camp. Al-Hol was built to house 7,500 people but currently holds 9,000 refugees. Save the Children says as well as the 5,000 people who had arrived in the last 10 days, there were 1,000 more waiting at the border. The UN has disputed these numbers and says that some of the new arrivals may be Syrian. It says says the camp received 912 people in the last 24 hours and is expecting a further 3,000 people who were dropped off by smugglers and are being cleared by security. The camp is being expanded to eventually take in 50,000 people, but Save the Children says the camp currently has just 16 latrines, is littered with waste and faeces, and has no clean water. "These families arrive with nothing but the clothes on their backs and find almost nothing to help them," said the charity's Tarik Kadir. "The camp is bursting at the seams and risks being overwhelmed." Iraqi government troops are moving towards Mosul from the south, while their Kurdish allies have been approaching from the east. But progress is expected to be slow, and a Kurdish commander Sirwan Barzani told CNN that it could be two weeks before Iraqi troops enter Mosul and two months before the city is liberated. IS fighters appear to be putting up stiff resistance in places, with the group releasing video purporting to show them firing on coalition armoured vehicles. Are you in the region around Mosul? Are you from Mosul? Let us know about your experiences. Email haveyoursay@bbc.co.uk with your stories.